Free coffee and baseball: This is a match made in heaven, from Sarah’s point of view. Two notes: 1. Jose Canseco is worried that he’ll get poisoned via free coffee. 2. 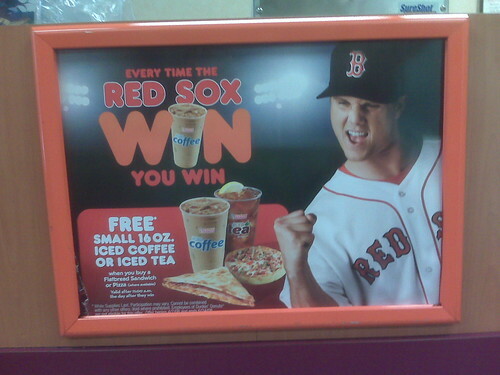 Jonathan Papelbon is advertising free coffee (with purchase of either a flatbread sandwich or a pizza) at Dunkin’ Donuts, available the day after the Red Sox win. Sounds a bit complicated to me—and it’s cheap of DD to exclude their own employees. Not to mention that Paps looks like a cheeseball in this photo. Why didn’t they just go with a real post-game shot? Speed: the Blue Jays are going to be swiping more bags this season. And speaking of speed, I enjoyed watching the A’s relievers throw over to first with Jason Varitek standing on the bag. Yes, let’s make sure the 35-year old catcher doesn’t steal. Fans: It just goes to show you that the Dodgers really do have a special relationship with their fans, as LA hurler Brad Penny warmed up with a lucky fan yesterday. Across town, Angels owner Arte Moreno bought souvenirs for several fans. And it seems that Baltimore’s long-suffering faithful are finally abandoning their ballclub. Just don’t get mad when the Sox come to town in May and bring their hordes of free-spending fans with them, transforming Camden Yards into Fenway South. The O’s need the revenue. No-hitters: Yesterday, ESPN.com carried a teaser for the Chicago-Detroit game saying the Dontrelle Willis was throwing a no-no through five innings. To me, that’s just false advertising. Sure, it’s technically accurate to say that D-Train ended up one-hitting the White Sox, but it would perhaps be more descriptive to say that Willis went five innings, while walking seven and striking out none. It was the least dominant no-no bid I’ve ever watched. An outing more worthy of ESPN’s hype would have been Jake Peavy’s two-hit complete game or Manny Parra’s legit seven-strikeout no-hit bid, carried through five innings. Reds Rookies: On the heels of Johnny Cueto’s stunning debut Thursday, another Reds rookie pitcher impresses today. Edinson Volquez has pitched five innings so far, with seven K’s and one earned run. He’s scattered three hits and two walks. Sleep: The Red Sox really do need it. Their odyssey from Florida to Japan to California to Toronto is starting to tell, and it’s most readily apparent on defense. Boston has already committed two errors halfway through today’s game. They had two errors yesterday, too, and have racked up a number of sloppy near-errors over the past few games. They have a day off tomorrow and open Fenway Park on Tuesday. the layout on this one. and yes I am very glad that the sox have the day off tomorrow – this was one of the most sloppily-played games I have seen from them in a long time. you could tell Youkilis was ready to punch him by the end of that game. Hmm, sorry about that Lyndsay. I have Firefox, and somehow it looked totally normal on my browser. I did some tweaking…hopefully it is fixed now!